I really like this bird and I think it's a favorite of mine that I hope to spy one day. I just think black birds in general are pretty cool. It looks like it has a touch of gray for distinction:) Hope you're having a good week! Wonderful photos as always! Especially like the composition in the second one - it's like this bird is personally bringing the viewer a bouquet of flowers. Love these guys! Haven't seen anyone post photos of them in a long time. Even their name is cool! That is quite a sharp look in its eye. I especially like the second with the flowers. Those eyes!! Wow. Bewitching. 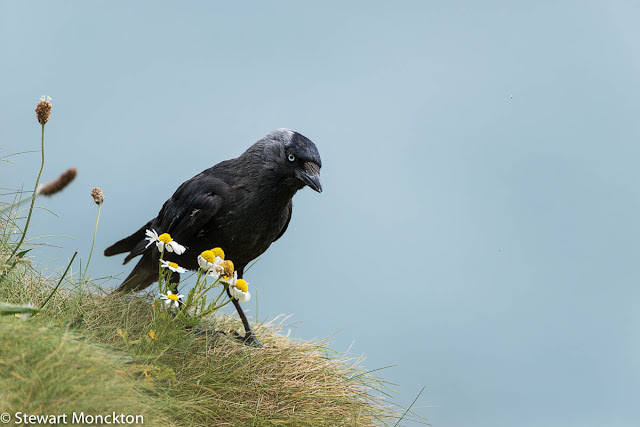 And the one image of the Jackdaw and the white daisy like blossoms is picture post card perfect. Hello Phil, your Jackdaw images are great. I do love the eyes on this bird, they have a sharp look to them! Thanks for hosting, have a happy week! Ah, bewitching bird and beautiful eyes indeed!! Superb captures, as always!! Have a great week, Stewart! Enjoy!! yes I aggree, a lot of birders over look this bird but I like watching it. I do not over look any bird. All are lovely in their own way. I love the jackdaws! I see them all the time. I wish you a good week! Nice shots Stewart. Jackdaws are one of the reasons my garden feeders get emptied so quickly. Great photos - especially the 2nd one. The bird look very inquisitive and quite ready for mischief I would think! Lovely shots, Stewart! I really like the composition with the flowers! Thanks for the presentation of the beautiful Jackdaw and the lovely lesson in Ornithology. I like the blend of black and grey on the head. Thank you for hosting Wild Bird Wednesdays. They have such gorgeous eyes! Agree with you, Stewart. The out-of-focus plants in the first shot make it really great, and I really like the flowers and overall composition in the second shot! Really fantastic shots, Stewart! They have a very fine-art look to them! I like how it appears to have gray feathers on the back of the head. I don't know much about birds but am crazy about photography and I like your 'trademark' style. Two great shots of the Jackdaw. Love your trademark too Stewart. These shots are amazing. Such beautiful birds! And thank you for the information. I had no idea! Hi Stew, yep I love them too, here's one from Cornwall a few years ago. they come in my garden here in the UK!! They're great birds, I like them. I sometimes think I only have 'common' birds to capture and then I ask myself 'says who?'. I also like when we share about the photography side of gathering what we share. Fantastic shots! The eyes are so intense! He's Very cute ... I like your trademark" background, always have, but the little jackdaw is also very sweet posed by the daisies. Really great shots, Stewart! I love this "different" look. 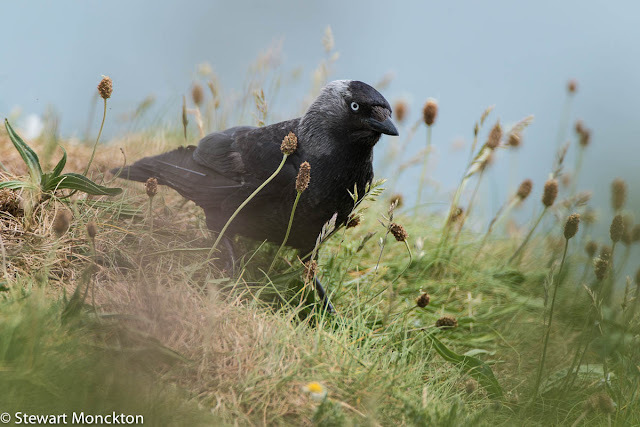 Nice pictures of the jackdaw. I'll bet he doesn't know his name is onomatopoeic. What a great photo of a Jackdaw. So they are crows....we have a ton of crows here in the Southern USA too. As far as I know they are just called crows. I must investigate..to see if they have a fancier name. Jackdaw is a great name. Madi and I thank you for stopping by our blog. Wonderful shots - what a beady eye he has! I can be very happy observing crows for long periods. They're very clever and seem to always do something unexpected. I like the framing of your shot with the flowers and sky. Very nice, Stewart! OMG, I started to comment on your Jackdaws and got interrupted and here I am two days later realizing I never finished it. Well, what I was saying, as I recall, was that all of the crow family are wonderful to watch and follow. They are smart and humorous and I think your Jackdaw with his graying temples is even a bit sophisticated. Your pictures are wonderful, Stewart and I am so glad to be back (sort of ... still fighting a few issues)in the fold. Hope all is well with you. Interesting, I just thought a crow was a crow. It is a pretty looking fellow though with that light eye. The crow I know of is big with black/dark eyes. They're my favourite corvid Stewart. So inquisitive and smart. Plus, very good looking and photogenic to boot. The eyes really do stand out in both photos, and I like the second photo with the flowers ... chamomile or feverfew? Stewart, thank you so much for your suggestion about your book reviews! I just went to those Pages and read every one, and I left a comment! Fabulous images Stewart! I particularly like the second!